It’s like I died and went to heaven but they realized it wasn’t my time so they sent me to a brewery instead. My brother and I had a need to chill sixtel kegs for a few upcoming parties this summer. 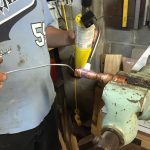 I have a kegerator that is rigged to dispense commercial and home brew sixtel and Cornelius (corny) kegs… but sometimes you don’t want your kegged beer to tie you down to just one location. 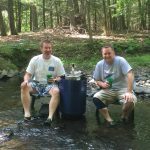 For Father’s Day this year (he’s a father, I’m a Godfather–if that counts) we wanted to bring a keg down to the brook and have a few frosty brews in the woods. One of the issues was… how do you keep it cold? 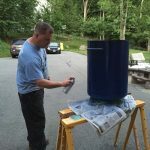 You can buy upright soda and keg buckets, but why by a plastic bucket when you can build custom beer dispensation that no one else has? 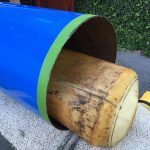 We took a recently blown-out 20 or so gallon pressure water tank and cut it open at the 22 inch mark with a grinding wheel. 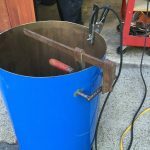 My brother fashioned two handles from some rebar and welded them to the tank. 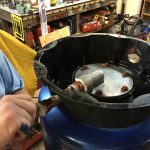 The handles–while great to have–are not completely necessary, so if welding is out of your comfort zone don’t worry about it… just lift with your legs. But as we found when transporting the tank, the handles are worthy of the word “handy” being in their name. 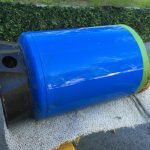 After a quick sanding of the jagged edges, we painted the inside with black Rustoleum paint and the outside with some shiny blue spray paint from some other project. It’s not blue because it’s sad or forlorn, it’s blue because it’s cool. We attached a hosebib to the bottom where it used to have an inlet tee so that the cooler can exist indoors and still be drained to the outside with a standard hose. And bam, we had ourselves a keg cooler. 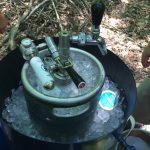 On Father’s Day, we ended up attaching a commercial keg to a home brew CO2 system (with adapters) and placed the whole thing in our new cooler. It holds a good amount of ice–I won’t lie, it’s like either two “big” bags of ice or one sleeve of ice. And it’s not insulated, but the steel stayed frosty. In the shade on a hot day it lasted 12 hours. In the end, we loved the steel cooler. It’s a bit heavy when it’s full… Google says that 5 gallons weighs 41(!) pounds so it was 60 or more total. The beer was cold, and in spite of a CO2 leak that we quickly squashed, it’s performance was chilling… and delicious. It’s next few uses will be for party home brew dispensing and I suspect it will work as planned. You can find lots of REALLY specific projects on the internet… this is one of them. Have you built something similar? Did you build this? Let us know!